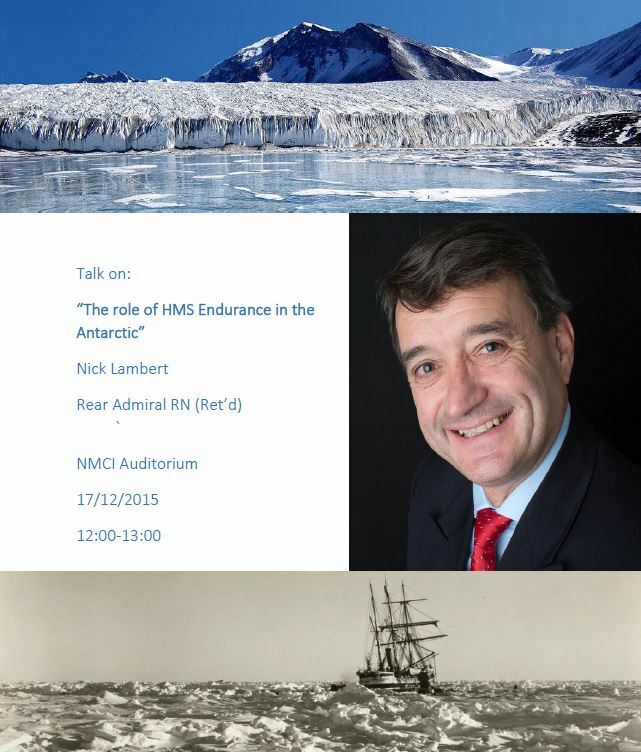 On Thursday December 17th at 12.00 – 12.40 Rear Admiral Nick Lambert (Ret) will give a lecture in the NMCI Auditorium on the role of the Royal Navy ship HMS Endurance in the Antarctic. It should be a really good lecture and it is open to everyone so please spread the word. Nick joined the Royal Navy as a seaman in March 1977. He gained an honours degree in Geography at the University of Durham in 1983. He has spent much time at sea on HM Ships including Birmingham, Ark Royal, Cardiff and has commanded HMS Brazen and HMS Endurance. He commanded the ice patrol ship HMS ENDURANCE from 2005-2007, deploying for two fascinating and deeply rewarding seasons in Antarctica. Promoted in February 2007, he commanded Task Force 158 in the North Arabian Gulf, tasked with the protection of Iraq’s economically vital offshore oil infrastructure. Thereafter he was Deputy Flag Officer Sea Training from 2008 to 2009 before assuming the role of Assistant Chief of Staff Operations and Capability Integration in November 2009 in the Navy Command Headquarters. Promoted to Rear Admiral, he became the UK National Hydrographer on 19 August 2010.